Airfree Tulip 1000 Filterless air purifier with beautiful color changing technology is maintenance free and totally silent featuring the patented Thermodynamic TSS Technology gradually destroys mold, allergens, dust mites, bacteria, viruses, pollens, pet dander, tobacco, ozone and other organic pollutants. It is perfect for mold contaminated areas as well as asthma and allergy sufferers. Covers 450 sq ft. Excellent for small areas like nurseries, bathrooms, playrooms, pantries and more. 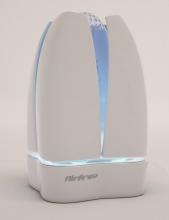 Airfree Tulip 1000 air purifier is the best maintenance free and silent air purifier PLUS features beautiful color changing technology. Top air purifier for germs and mold when noise and space can be a concern. 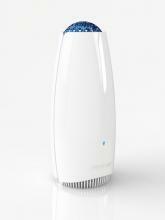 Eliminates dust mites, bacteria, fungi, virus, pollen, allergens of domestic animals and other microorganisms from the air. Covers 450 sq ft. 2 YEAR Limited Warranty. Airfree Tulip 1000 comes in the color white. The Airfree Tulip 1000's exclusive patented Thermodynamic Sterilizing System (TSS) technology has been independently tested in "real life" working environments by world renowned institutions and ISO 17025 laboratories in six different countries including the USA, Sweden, and Germany. These tests prove that the Airfree Tulip 1000 Air Sterilizer totally destroys up to 99.99% of microorganisms that pass through its patented TSS system no matter how small or hazardous they might be. 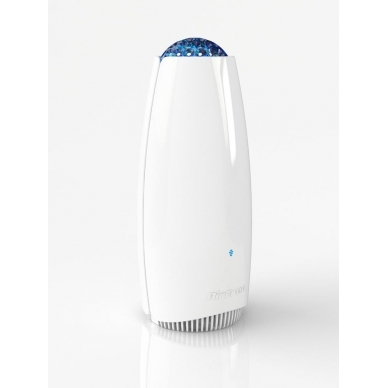 Airfree Tulip 1000 Air Purifier, the newest and cleanest technology to help reduce indoor air pollution... silently too. Inside the Tulip 1000's patented ceramic core, 99.99% of all microorganisms: spores, fungus, bacteria, virus, mold spores, are incinerated at temperatures around 400F (250C). That is done without significant heat contribution to the unit. No living microorganism survives this power. Airfree Air Purifiers & Sterilizers reduce Ozone. Ozone generators generate dangerous levels of ozone which in turn destroys lung tissue, triggers respiratory diseases, and corrodes metallic equipment. The Airfree P1000 uses just heat. No additional V.O.C. 's are generated. Airfree Tulip1000 offers exclusive Patented Thermodynamic TSS™ Technology. Airfree applies the same concept as boiling water by using heat to destroy microorganisms and attains 100% efficiency at the Airfree air outlet. Airfree Tulip English (US) from Airfree on Vimeo. Choose your favorite night light color and change it whenever you want. Create a more pleasant environment by choosing one of the 10 night light colors and its intensily or select the ‘random’ mode and let the colors alternate softly for you. The technology was initially developed by an initiative and creative Portuguese businessman in an effort to find an effective way to ease his son’s allergy attacks. Wondering which Airfree unit is best for you? No problem, check out our helpful Comparison Chart. 5.0 Love it! 04/10/2019 By Jeannie I purchased a TULIP unit through US Air Purifiers. I started using it earlier today and already feel better and have more energy. I am thrilled with the unit!